Bucks Win? Bucks Win? ~ The Bucky Channel - The World of Sports from Wisconsin's Perspective. Home » Bobby Simmons , Milwaukee Bucks , New York Knicks » Bucks Win? Bucks Win? 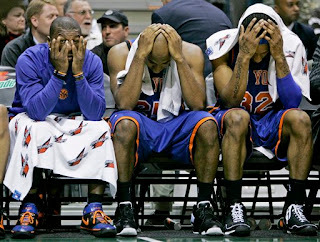 Even if the Bucks are in tank mode, it's still pretty hard to try to lose to the Knicks. No matter how hard they tried, the Bucks couldn't lose tonight, coming away with the 119-115 victory against New York. As I've expressed earlier, I'm at the point where I'd like to see the Bucks start positioning themselves for next year. With that said, it's still nice to see every once and awhile that these guys do care, and are giving an effort night in and night out. Also good to see Bobby Simmons get some time on the floor, knocking down 24 points in 29 minutes. Fantasy playoff pickup, question mark?